Dress your little one head to toe in our finest collection of shearling and wool. From our gorgeous 100% shearling pram shoes to cocoon tiny toes and ensure they’re warm and cosy, to our shearling crawler shoes from babies on the move, there is plenty to choose from. The beauty of our kid’s collection is that each product has been specially designed with children in mind. Take our crawler shoes for instance, crafted in Cornwall, they have been designed to give growing feet a little extra room while being as soft and cosy as possible. With a handy Velcro strap to stop them from slipping off during playtime, they are ideal for babies between 6 to 12 months old. Our shearling pram shoes on the other hand are a luxurious yet practical gift idea and have been made in the UK. Machine washable, they are easy to keep clean and offer ultimate comfort. Keep your baby cool in summer while warm and cosy in winter with our incredible 100% shearlingfleece. Place in a cot, pram or as a play mat and watch as your child enjoys the soft and comforting fabric. Machine washable, our shearling fleece makes a brilliant addition to your child’s bedroom, nursery or pram. 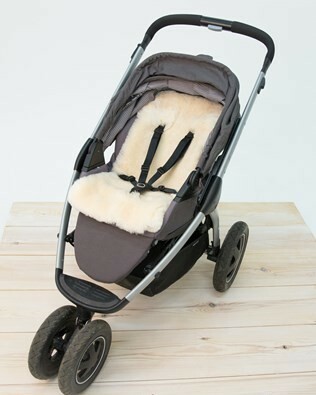 Or choose our 100% shearling pushchair liner and enjoy the softest shearling on the go. Pair with our Flatout Bear and allow your little one to snuggle up with this cosy design. Suitable from birth, the shearling bear can be hand washed and is perfect to add a little warmth and natural comfort to your child’s nursery, cot or pram. 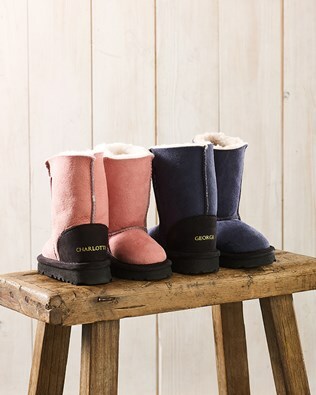 Shop our online kid’s collection of shearling boots, booties and comforters. Enjoy free returns on any online UK order. If you’re buying a pair of children’s shearling boots as a present, feel free to take full advantage of our personalisation and gift box service.